Located right in the centre of the city’s Golden Triangle, Banyan Tree Kuala Lumpur will be the ideal choice for visitors looking to stay within the commercial, shopping and entertainment hub. This urban resort occupies the top seven floors of the Banyan Tree Signatures Pavilion Kuala Lumpur, which is one of the most striking buildings in KL. The 55 rooms and suites have been designed with the discerning traveller in mind, and where contemporary chic and pure luxury ensure that these are the most elegant rooms in the city. Views of the Petronas Twin Towers and KL Tower only serve to enhance the experience. Signature aromatherapy essentials and chromotherapy showers are available in all rooms, while private relaxation pools in the suites are a real treat after a long day out. Banyan Tree Hotels and Resorts are also known for their dining venues which are all designed to heighten sensory and culinary experiences. Bake by Banyan Tree is a French-inspired bakery located in the lobby, Altitude is a great venue for afternoon tea and fines wines on the 53rd floor, Horizon Grill is an exquisite seafood and grill restaurant on the 58th floor, and Vertigo on the 59th floor looks set to be the tallest hotel rooftop bar in the city. Mention Banyan Tree and one of the first things that comes to mind are their superb spas, which have won various prestigious awards. The spa in Banyan Tree Kuala Lumpur has four couples’ spa suites, and massage treatments are based on a ‘high-touch, low-tech’ methods using natural herbs and spices. 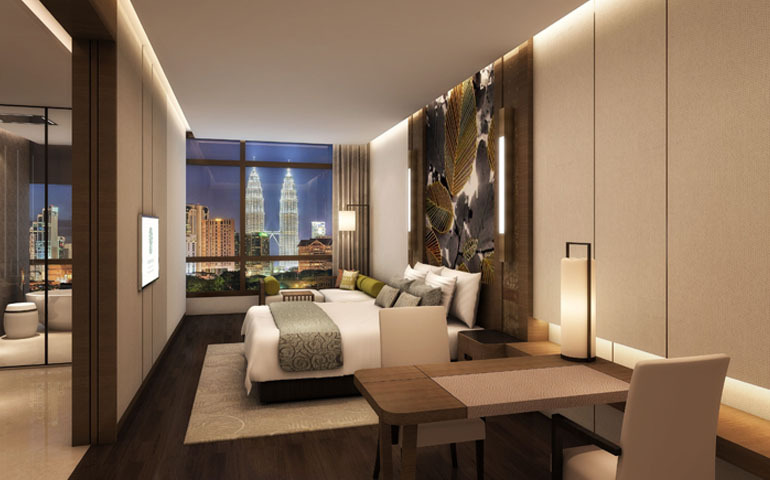 Banyan Tree Kuala Lumpur will be ready to offer guests a private haven in the heart of the city in June.